When you want to get married near the water and a place with historic charm, Edgartown has you covered. Matthew Bacon wanted to get married near the water. His fiancée Stefanie Gera wanted their venue to have historic charm. Edgartown was the natural choice, they decided. Matt has been visiting his family’s Oak Bluffs home since the mid-‘90s. Plus, said Stefanie, “it was the perfect location to allow [the rest of] our family an opportunity to visit somewhere new” as they traveled to the destination wedding. At first Matt, a registration specialist at the Smithsonian American Art Museum in Washington, D.C., and Stefanie, a public affairs specialist at the U.S. Environmental Protection Agency, envisioned a ceremony beneath the Edgartown Lighthouse. But the logistics of having guests trek to a separate reception site weren't appealing. Instead, they sought out a venue that could hold both the ceremony and reception. The 1840 Dr. Daniel Fisher House fit the bill. 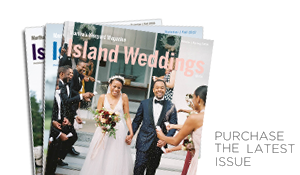 Before they could sign the venue contract and nail down a date, however, Stefanie had to make sure her favorite flowers – coral charm peonies – would be available. 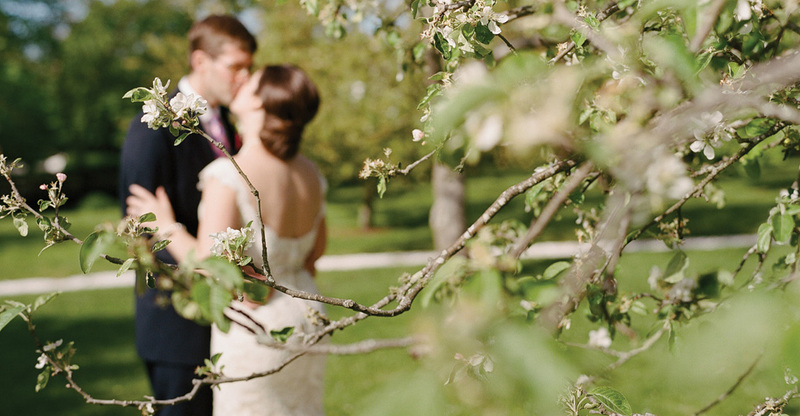 Serving as her own wedding planner, she called flower vendors one year prior to the anticipated springtime wedding to see if they would have what she wanted. Donaroma’s came through. On a May afternoon Stefanie and Matt exchanged vows in front of the garden pergola. Because their guest count was small (just twenty-five people), the reception was held inside the Dr. Daniel Fisher House. Simple navy and gold décor complemented the historic property “to honor the look and feel of the home,” she said. Loved ones added a handful of DIY elements, including hand-embroidered napkins with navy “B”s by the mother of the bride and champagne glasses spray-painted gold on the bottom by Stefanie's sister-in-law. Although they didn’t say their "I do’s" next to the water, they made sure to take photos there. “We were determined not to lose that,” said Matt. The Martha’s Vineyard Museum even opened up the Edgartown Lighthouse just for them.